A lone climber on the left part of sector Vermell de Xincarró. Click the photo for help locating the climber. Are you planning a visit to Montserrat in the near future? Within a month, temperatures will drop and the south side of Montserrat will be a very good option for climbing near Barcelona. Sport climbing on the south side can be defined in one word: endurance. Here we are going to recommend you some of the most representative sectors of Montserrat’s south face, with plenty of routes from V to 8th grade. More than 160 routes from IV to 7c+. It consists in two walls forming a right angle. One of the walls is east faced and the other one is south faced. This makes it possible to climb here any day of the year. The majority of routes are quite long (30m) and probably, you’ll find the low grade routes a bit polished. That’s because it was one of the first big developed crags in the south face. Topos: East, South 1, 2, 3, 4, 5. Courtesy of Onaclimb. More than 150 routes from V to 7c. If you pass the Vermell del Xincarró crag and keep walking 15 minutes more, you will arrive in the middle of a dry torrent. The wall on the left (east faced) is the Desdentegada, the other wall (west faced) is the Cova de l’Arcada. 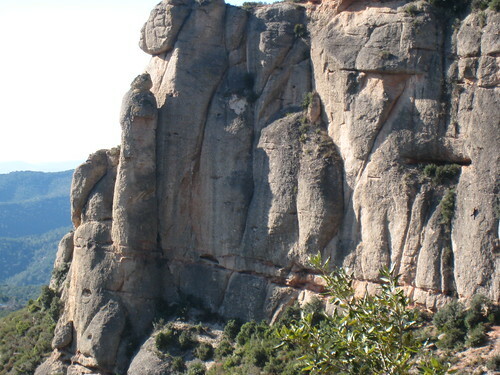 This two crags are newer and less crowded than El Vermell del Xincarró. Desdentegada is better if you are in the 6th grade. Otherwise, if you are climbing in the 7th grade, Cova de l’Arcada is your crag. Prepare yourself for enjoying long routes, small holds and technical moves. Topos: Desdentegada 1, 2, Cova de l’Arcada 1, 2, 3. Courtesy of Fernando. This is a small crag in comparison to the others of this article, but here you’ll find 20 routes from 6a to 8a+. Mainly are between 7b and 8a+. The best 8a’s endurance climbs can be found here. If you keep walking a couple of minutes more, you’ll arrive to the Agulla fina. Prepare yourself for 60m 8b’s. One of them bolted by Alex Huber and called Un poco loco (a little bit crazy). I’m sure it’s because he only used 11 bolts in all the route. Scary! Topos: Contrafort del Senglar. Courtesy of Fernando. Well, I’m sure you have homework enough if you decide to come climbing in Montserrat. This might not seem like it but it is just a small selection of sport crags in Montserrat. These topos and lots of other ones, can be found in all the Montserrat’s available guidebooks in our on-line shop (open in january). Tagged with conglomerate, montserrat, sport climbing, taste-menu. Nice post, the only thing i would add is that climbing in Montserrat is special – it is endurance alright, but it is also very TECHNICAL – it is all about your feet, especially in Cova and Vermeil. Senglar is a little bit more athletic and slightly overhanging, resembling already more limestone than usual Montserrat pebbles (i.e. Discordia route is more about pocket pulling than anything else). Also, sun hits Cova only after 14 00, and it is FREEZING there before. Senglar on the other hand is in the sun all day long. And last but not least – what about a little story why most of these climbs are NOT in the Montserrat SUR guidebook and only visible on the websites/blogs – despite being one of the best sport climbing sector in Montserrat?? Autumm-Spring, depending on how cold or how warm the day is, you can start climbing in a wall and then switch to the other in less than a 15 minutes walk. And about your last question, I only know what it has been told in climber forums, bars, etc… I don’t know Joan Llasera (the aperturist) but I only know he did not want those sectors to be published in the guidebook. I don’t know why, because those walls are quite obvious for climbers. But, lucky for us, information is free and lots of blogs, forums, webpages and “llibres de piades” have the information and we can go climb there. i think it has smth to do with his having been critiqued by other fellow climbers for bolting too much, especially when he went up to the Agullas sectors, although this is based on rumors only…Anyway i´m very grateful to the guy as it´s loads of work he´s put into bolting all that, and there are few jewels of routes there! Yes, his actions hadn’t the support of all the climbing comunity. He did massive boltings in Arcada and Desdentegada. The only objectionable thing here is he did not let space for others to set their routes. Till here, I can only say he arrived first. The bad things happen when he started bolting sport routes in Agulles, very close to classic and expo routes (that’s what I’ve read, I’ve not seen anything). Lots of classic climbers where angry about his way of working, setting bunches of routes anywhere. They did a demonstration in the Agulles refugee to protest against his behaviour. In my opinion, I don’t think massive bolting it’s good. Most of the routes became straight lines parallel and very similar than the others next to (of course there can be perfect lines, jewels as you say). I preffer a crag developed in years instead in a week, lines become more natural and the way to exploit it too. For example, Vermell del Xincarró. By the way, Joan Llasera bolted lots of routes in Racó de Missa, in Montsant. I don´t have a stance on this, I climb everything, however one of the things you guys are trying to do with this website is to get the climbers´ equivalent of mass-consumption into the hidden territory of Cataluña, I hope you do realize this xD ! I can´t add anything to the discussion above but I really like these taste menus. Gives you a taste of the area and helps me decide where I should go in the vast ( climbing wise, not geographical) area of catalonia. Because when I go on a climbing trip I rather go to a good area than to a bad one I think everyone agrees with me on that. Adding to the fact there seems to be enough rock for everyone I like people to point where the cookie is and then let me decide where the raisins are. After all taste is subjective. I am hoping to head up the this Friday 25 of jan 2013 but without much more details there will be many wasted hours. So far all the blog guide dont exist anymore or haven’t be created, I have a google topo map but that’s about it. Anyone keen for a climb or some info?